Planning a party? 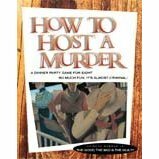 How To Host A Murder is the best-selling murder mystery game designed to keep party-goers guessing for hours. In each self-contained episode, the layers of a complex murder are peeled away as the participants assume the roles of the suspects. Clues guide them toward sniffing out the culprit in their midst. No one, not even the host of the party, knows who that is until the end of the game! It is 10:10 p.m., 2 July 1881-a balmy evening in the little Wyoming Territory town of Roadkill. In response to a warm invitation from His Honor, Judge Waylon Payne, you have gathered in his home, beside the courthouse, in the heart of town, for a sumptuous dinner. Dinner will be followed by the hanging of the infamous, formerly elusive Malevolent Seven - a villainous gang of criminals rumored to have secretly victimized your fair territory for many years. Although no one knows the identity of the Malevolent Seven, everyone will find out tonight. Having mentioned your name in his Roman epic, the renowned poet, Flabbius Corpus, invites you to a banquet for the premier recitation of his historical work. When you arrive, you discover there's been a murder in the garden and a priceless statue is missing. You assume the role of one of these great Roman characters and solve the mystery. Like a history lesson come to life, the schemes of less-than-noble characters are laid bare. It is 1959 in a small town in the USA The local high school class of 1954 has scheduled its 5th year reunion to coincide with the return of Rockford "Rock" N. Roley, the student who became a famous rock 'n roll star. Excitement is running high until the recollection of a high school prank leads to the discovery of murder! You'll be "most likely to succeed" at unraveling the mystery if you'll do a little homework into the history of the fascinating members of the class of '54. It is September 1928 in Chicago. Notorious gangster Harold "Hal" Coppone's return is expected to trigger a wave of violence. Instead, Coppone has disappeared, mystifying police and the criminal underworld. To the small group gathered in a speakeasy near Coppone's headquarters, the crime lord's whereabouts become only part of the mystery when murder is discovered. There's no shortage of suspects, motives, speakeasy glamour or gorgeous flappers in this crime tale. It is June 1895. Arthur "Art" E. Faxe, the eccentric Englishman, has invited eight guests to participate in an archaeological dig at a site in Mesopotamia. Almost immediately, rumors circulate of an important find, but excitement gives way to dismay when murder is committed. Beneath the surface, in the fascinating mélange of guests and their shared histories, lies the answer to the murder. It is January 1936 at an English country mansion. Sir Roger Watersdown, the wealthy owner of Watersdown Beverages, Ltd., has invited several friends to a weekend party in the countryside at his mansion. But soon murder is discovered, and the friends must decide who among them committed the crime. Perhaps the answer to this crime can be found in a deeper investigation of the setting and the relationships between host and guests? How too, too awful a beginning to a country weekend. Since you happen to be among the tuned-in, turned-on crowd, you've been invited on a cross-country road trip to Beefstock with one of the hippest rock singers of all time--the legendary Miss Hedda Leiss. While you're hanging out at her "love pad," an explosion rocks the house. The psychedelic bus you were going to take cross country has been turned to dust with someone on board. It is September 1931 at an English country estate. The 13th Duke of Airesborne has invited his eight possible heirs to announce just who among them will be the successor of his title. However, before his announcement, the Duke is murdered in a hot air balloon accident. The potential heirs must figure out who among them killed the Duke and the other unfortunate victims! Clues aplenty can be found in the news report of the Duke's accident. It is 8th Century China at the Festival of the Autumn Moon. Guests of the Hoo family have been invited to gather in the grand hall of Hoo House at the Hoo-Hung-Wu Islands. Hoo House is an elegant Chinese mansion and the summer house of the Hoo family. As guests gather for an evening of reflection, poetry and feasting, the celebration gives way to deadly dismay about Who Done It! It is June 1940 aboard a train leaving from Paris. The German troops are about to enter the city. Roads are a hopeless snarl; the trains are full with little space aboard them. Yet, to remain in the city will not be pleasant. Aboard a government train heading for the safety of southern France, a murder is discovered. The passengers (your guests) must decide who committed the crime. Certainly, the elegant refugees and the dramatic circumstances of their flight from Paris will provide the answer to this mystery. Lots of fun, especially if you're a Halloween-type person.